The Cafe has closed down. Not a lot is known about Burmese cuisine, nor will you find Melbourne dotted with many Burmese restaurants. Free Burma Cafe is the perfect opportunity to take the taste buds on an uncharted journey of modern and traditional Burmese food. Cafe style, the price is right at an average of $10 to $16 for your mains. Limited parking on street front, Alfresco area rear of cafe, spices, books, Burmese bags for sale. 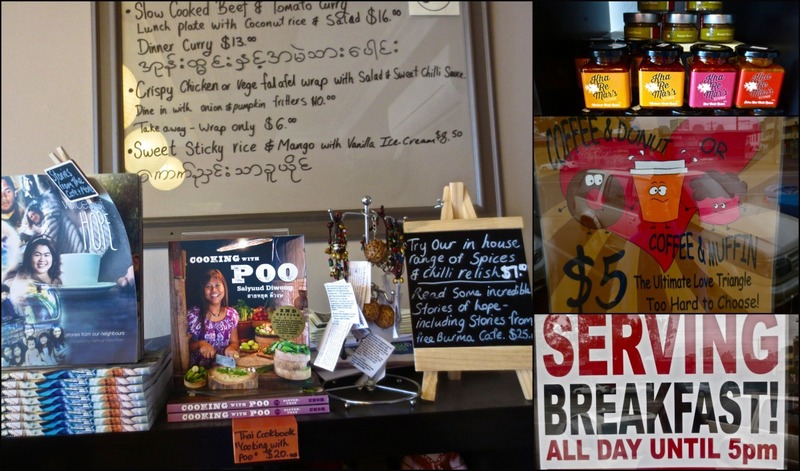 Free Burma is not your ordinary cafe; it is a social enterprise cafe. With the help of UNOH's (Urban Neighbours of Hope) Springvale team, the cafe was set up and it is a source of training and employment to the Burmese refugees. It's about giving them a sense of dignity and belonging. Free Burma can cater for your function, or for something different, they can help you host a Free Burma Information Night where you will learn about Myanmar (used to be Burma) and its refugees, while experiencing its cuisine. Books from Thailand and Burma/Myanmar for sale, In house spices made by the chef, Breakfast all day till 5pm and Coffee with Donut or Muffin for $5. Books about Myanmar and its struggles and Thai cook books are also sold on the premises along with in-house spices made by the Free Burma Cafe chef, along with a few other items. [ADVERT]With more than 80 items on the menu, I'm sure there will be plenty to tempt your taste buds. Taste entrees of pumpkin and onion fritters, and Burmese style falafel to name a couple, and a variety of soups, curries and some traditional meals like Mohinga and Ono Kautswe (Burmese laksa). There are vegetarian and vegan options along with a kids menu and Burmese desserts. You might get lucky enough to truly challenge your taste buds if you happen to pop in on a day they have fermented tea salad (La-phet) on the menu. Memories flooded back for me as I drank my Burmese coffee, which consists of coffee with a big dollop of condensed milk. In Myanmar, back in the day, you didn't get asked if you wanted milk or not, or if you wanted one lump or two. Everyone drank out of the same big pot of black coffee with dregs thick enough to stand a teaspoon in, and condensed milk its only other content. Vegetable curry with rice, salad and chilli, Sticky ricecakes topped with coconut and served with mango and coconut ice cream, Fermented Tea being prepared, and Burmese coffee. Street parking in front of the cafe is minimal and the side street only has around six parking spaces in the far end of the street (5 minutes walk). Trading from 8.30am to 4pm during the week and open later in the evening from Thursday to Saturday trading hours can vary. It's best to call and check with the cafe. You can also find them on Facebook where they seem to update their operating hours regularly. The Cafe has since closed down :( with intentions to open at another venue down the track.